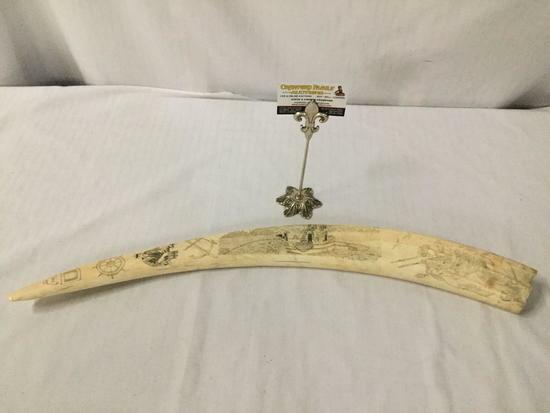 Alaskan Inuit carved walrus tusk, approx 27 x 3 inches. Approved for sale by both Federal and State Fish and Wildlife Agencies. Can ship anywhere within the U.S. only. PLEASE READ: This auction company has requested and been granted access to see all bids placed including any maximum pre-bids. This auction is permitted to engage in this activity by providing this clear disclosure to you, the bidder. Payment Instructions: Please Read. We accept Visa, MasterCard & Discover only. A 17.5% online buyer's premium will be added to all sales conducted via Proxibid. At the end of the auction you will be sent an invoice via email which will indicate your total amount due. Your credit card on file will be charged once for purchases + applicable sales tax, then once for all applicable shipping & handling charges. (Unless otherwise stated on your invoice) If needed, please contact the auction house prior to the auction start time to discuss special payment and shipping arrangements. If no prior arrangements have been made, the card on file will be charged according to your invoice. There is no sales tax on U.S. coins & currency. No Chargebacks – If an unauthorized chargeback is made, there will be a $35 NSF fee applied to the total amount due on your invoice. Crawford Family Auctions inspects every item carefully & describes each lot to the best of our ability. However, every lot is sold as-is, where-is, and ultimately the buyer is responsible for all lots won at auction, no exceptions. All Payments are to be made in USD. Credit cards that are declined more than once will be subject to a $35 NSF fee on a case by case basis. Any Items not paid for within 7 days of close of auction will subject to forfeiture, and will be resold. All deposits made are non-refundable. If a bidder wins a lot & neglects to provide payment, then there information will be sent to Proxibid & flagged as a non-paying bidder which will result in a ban from using Proxibid until the debt has been settled. Shipping cost is the sole responsibility of the buyer. Your credit card on file will be charged once for the total purchase amount + sales tax & then once more for shipping & handling, when applicable. Once the item is packed we will charge the card for shipping (with some exceptions). If the card comes up declined, we will attempt to contact you via email and phone. After 10 business days, if no special arrangements have been made, and the shipping is still unpaid, then all winning lots are considered abandoned goods & will be resold in auction. This will also result in the forfeiture of all payment remitted for said lots and a possible ban from future auctions. There will be no sales tax charged for online sales unless you live within the boundaries of Washington State. Please call or email with any questions or concerns. Preview Date & Times: Please contact the auction house for preview dates & times. Checkout Date & Times: Items will usually ship within 10 business days or 2 weeks of payment being received. Freight options will take longer based on the availability of the freight company. All international purchases will go priority mail, no exceptions. Driving Directions: Please contact the auction house for directions. Please Read. All items are sold as is, where-is, with no warranties or guarantees expressed or implied unless otherwise stated in the lot listing. All Sales are Final, no exceptions. It is the sole responsibility of the buyer to due there due diligence, and inspection, and ultimately the buyer will be held responsible for all lots won at auction. We reserve the right to add or delete items prior to sale time. We aren’t coin graders, or memorabilia authenticators, nor do we profess to be. Any grades, or comments in regards to condition or variety on any coin, jewelry, or other items is from the consignor and or authentication company. Crawford Family Auctions LLC is only relaying that information and will not be held accountable for disputes of item quality. Please send any specific questions to our email address or call us for more information. On-line Bidding Terms: 1. Crawford Family Auctions LLC, has put forth great effort in preparing the catalog and providing accurate descriptions of all items listed in the auction. We do our due diligence to make sure we sell quality products and list any defects we notice. That being said, all property is sold as-is, where is, and it is the buyers responsibility to determine the exact condition of each item. Printed statements or descriptions by sellers are provided in good faith and are matters of opinion. Crawford Family Auctions, its owners & staff, are not experts, and don’t or cannot authenticate any items represented in the auction catalogs. All representations made are those of the consignor(s), and or an authentication company, usually in the form of a Certificate of Authenticity, or COA. By registering, and bidding in our auctions, all bidders agrees that, Crawford Family Auctions LLC, its owners, and any of its affiliates, will be held harmless against any claims in regards to the authenticity of any lots or merchandise purchased in our auctions or from our warehouse. Jewelry/Precious Metals – Crawford Family Auctions does assure the accuracy of precious metal lots such as gold rings platinum bracelets, sterling silver necklaces, etc. If the stones or material is determined by a professional to be lesser than or does not resemble the lot description, then the full purchase price will be refunded upon proof being provided by the buyer. This does not apply for items that are melted, broken, damaged, etc. If an item has to be noticeably altered to determine its validity, then a partial refund may be given on a case to case basis. The conditions for the exceptions are as follows: Authentication for coins & currency must be made by NGC, PGCS, or ANACS. Authentication for gems & jewelry must be from a licensed reputable appraisal service. 2. There is a 17.5% Buyer's Premium added to your total invoice amount for all online bidders. 3. All accounts must be settled at the conclusion of the auction. We accept Visa, Discover & MasterCard only. No checks will be accepted. 4. The auction company, through USPS & Fedex will arrange packing & shipping. Packing & shipping costs are the responsibility of the buyer and may be quoted before shipping. We do our best to package and handle in house, however some fragile or large items might require the packing services of a professional shipping company. Please see the Shipping section for more details. 5. Our on-line auctions move quickly! If you are interested in an item, bid quickly. If you win an item in the auction you will be notified by email by the next business day. All items will be charged to the credit card on file unless other arrangements are made prior to auction start time as listed. 6. In order to better serve our customers, all bidders must provide their name, address, daytime phone number, and email address at which they can be contacted. This is to insure good communication between Crawford Family Auctions and the bidder throughout any transactions. 7. The purchaser agrees to pay all reasonable attorney fees and costs incurred by the auction company in the collection of funds, and any losses incurred by the purchaser's failure to adhere to the terms listed. The purchaser also agrees that any items not paid for in full within 10 business days of the auctions closing (unless other arrangements have been made with Crawford Family Auctions LLC) will result in forfeiture of item and any payment received will be considered non-refundable. Any debt collection or dispute proceedings will be heard in Thurston County, Washington State. 8. The auctioneer has the sole discretion to advance the bidding and may reject a nominal advance, should it in his estimation prove injurious to the auction. The auctioneer shall be the final judge in all bidding disputes and shall name a bidder as the purchaser. 9. The auction company shall not be held responsible for any "missed" bids or bids unseen by the auctioneer. 10. All sales are final. 11. By bidding on any item, the bidder shows acceptance of the terms of the auction. 12. The auction company reserves the right to refuse service or decline registration to any person for any reason. 13. All announcements made day of auction take precedence over any and all written, verbal or electronic statements. 14. By registering and bidding in one of our auctions you are giving Crawford Family Auctions LLC the right to contact you via email or phone with future & current auctions/sales notifications. All bidders are automatically added to our weekly email newsletter.